We hope you’ll join us for our 2018-2019 Season! A celebration of American Opera, performed by members of Opera on the James’ Tyler Young Artist Program and regional artists. Including Sweet Betsy from Pike, words and music by Mark Bucci, A Hand of Bridge*, composed by Samuel Barber with libretto by Gian Carlo Menotti, Trouble in Tahiti by Leonard Bernstein, and selections from Porgy and Bess, George Gershwin’s iconic American classic. Performance schedule: November 4 at the Warehouse Theatre, Academy Center of the Arts and November 10 at Timberlake United Methodist Church. All tickets are General Admission and cost $20. There will also be a free community performance at Court Street Baptist Church on November 11 at 3pm. Call 434-528-3397 for tickets or CLICK HERE to purchase tickets online. 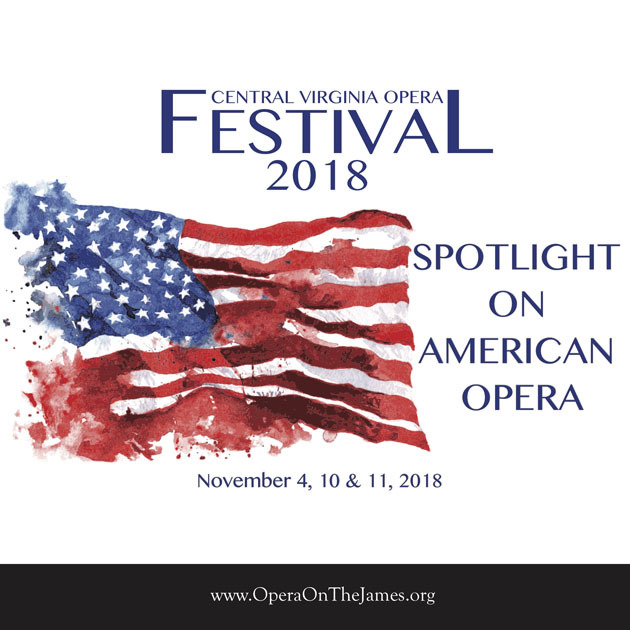 *A Hand of Bridge will only be performed as part of the Central Virginia Opera Festival on November 4 at the Academy; it will also be performed at Randolph College November 16 as part of that evening's chamber orchestra concert. Sunday, November 4, at 3:00 p.m.
Saturday, November 10, at 3:00 p.m.